When Doc Brown went to the future, he pretty much did what we'd all want to do. The first thing he did was go and get a few years wiped off his face with some kind of new treatment. The second thing he did was get a hover conversion on his car so it could fly through the sky. The third thing he did was update his clothing so it fit in with the future folk and, let's be real, so he could look super awesome and like nothing the 1980s had ever seen. 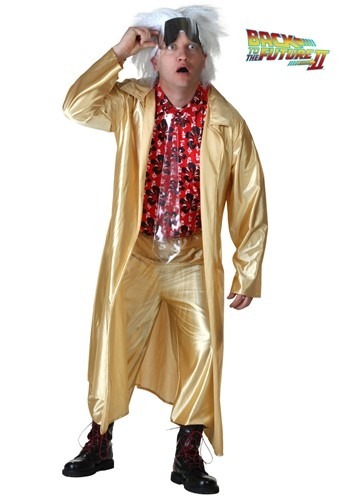 So, we think everyone should follow in Doc's footsteps and wear this plus size Doc Brown costume so you can look exactly like you came back from the future too! Wait a minute... what year is it again? Whoa... the future already came!